GLO NEWS: Journal of Population Economics, Volume 31 Number 3, now available online! GLO NEWS: Journal of Population Economics, Volume 31 Number 3, now available online! GLO NEWS: Journal of Population Economics, Volume 31 Number 3, now available online! The Global Labor Organization (GLO) supports the Journal of Population Economics. 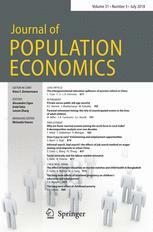 We are pleased to distribute the new table of contents alert for Journal of Population Economics, Volume 31 Number 3 in 2018, which is now available online. FREE ACCESS FOR SIX WEEKS!